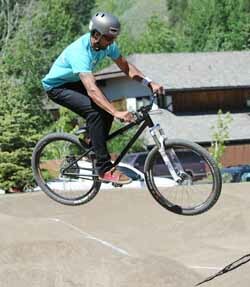 Men’s adult open-class winner Matt Slaw sails over some terrain in Ketchum’s public “pump park” during Idaho’s Pump Track State Championships held Sunday as part of the Rhythm & Ride Bike & Music Festival. Event co-ordinators Brendan Coyle and Julian Tyo said they were happy with the outcome of the races and the community support they received. “The turnout was great and the races were a beautiful ending to the park’s first spring season,” Coyle said. More than 40 competitors took part in Sunday’s race. George Merchep and Sage Holter were the boys and girls winners in the 9-and-under class. The 13-and-under class winners were Alex LaFleur and Libby Kaiser. Marketing 101: Is there a right way? What does the Fourth holiday mean to you?